Now you can buy or rent Sky Store movies on LG TVs | What Hi-Fi? Owners of any webOS-powered LG smart TV can now use the Sky Store app. 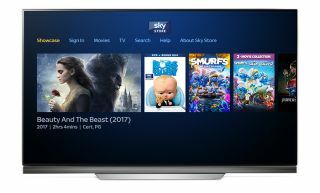 While the Sky Store app already features on NOW TV and Roku streaming platforms, this marks the first time it’s been integrated into a smart TV platform. And it doesn’t matter if your LG smart TV is a few years old, either. Any model running webOS – whether it’s the 1.0 version, or the current 3.5 iteration found on its 2017 OLED TVs, such as the LG OLED55C7V and OLED65E7V – can benefit. We have continuously praised the operating system over the years, not only for its speedy, intuitive user experience but also its wealth of apps – and this welcome addition makes it all the more attractive. New movies are added to Sky Store every week, while new releases, which currently include Beauty and The Beast, Get Out and Logan, are available to rent immediately after their theatrical release. What's more, when you buy a movie, you get the DVD in the post as well as the film in HD to stream right away.